Figured I would go ahead and get another night shot out of the way. As with the spiders in the previous post these shots were taken late night on our porch. Some people have bird dogs other rabbit dogs. I happen to own a frog and toad dog. When our poodle heads outside, he always does a quick look around the porch to see if there are any toads or frogs hanging around and makes sure he puts his nose no farther than a millimeter away. The running joke is that Rizzi is a junkie and likes to lick the frogs to get his fix. 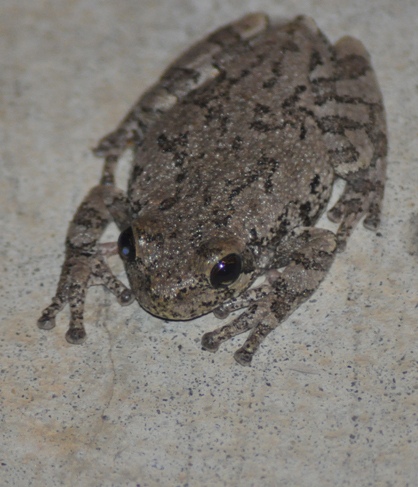 That was the case the night I took this frog shot. It was definitely started by the flood of lights (not to mention the personal space violation from Rizzi). I was afraid to get to close so I didn’t have a chance to give a visual size reference, but this one was around 3 inches. The flash gave some pop to the eyes but again lost in the ‘shopping. I am guessing this little creature is impossible to see on a tree trunk or in the dead leaves. Not such great cover on the cement. I probably need to pick up a frog reference when I go to pick up my spider reference book. After quick searches on the web and a follow up with the trusty Wikipedia, the consensus is Gray Treefrog or Hyla versicolor. Apparently if I had waited for it to jump there would have been color under the legs. You don’t believe that did you? Of course I did not just “wait” for it to jump. After 5 minutes of trying to entice it with my toe in order to get the super cool jumping shot, I gave up and went to bed. One of my chores, if you will, is to take our dogs out before retiring for the night. Due to the potential for coyotes and other non-friendly pet wildlife we coexists with out in the country, this involves hitting our flood lights which illuminates our entire porch and a large section of the yard. You cannot be too careful when taking care of a 5 pound dog. This instant light tends to surprise animals, insects and the like. As a result, I tend to see some interesting (and sometimes scary) things previously undercover of the night. I decided to snap a few shots to share the experience with my readers – especially those people who have not experienced the country life. 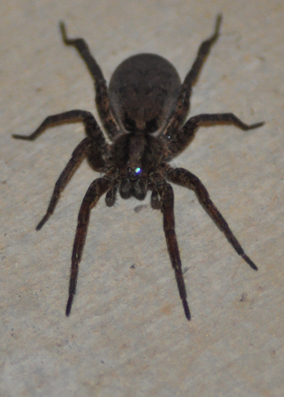 The first subject for the night dwellers collection is the Wolf Spider. Interesting enough, I have often heard these spiders referred to as Timber Spiders, but I was unable to find that name on the web. It may be time to hit the bookstores and pick up a spider reference book since at least once a week a new species pops up around here. They are not venomous to humans, but their hairy texture and potentially large size have a tendency to provoke pretty aggressive stomping by those caught off guard. 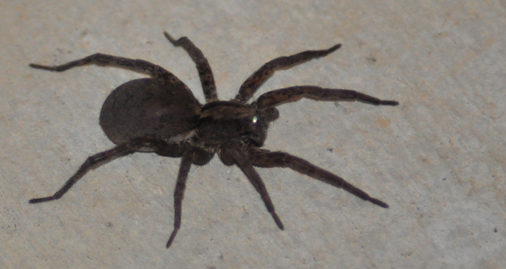 As an FYI, the Brown Recluse is really the only venomous spider we have to worry about around here. Those tend to avoid any contact and therefore not a big concern but I do give a quick scan of the woodpiles and such just in case. My general rule is to let all insects and arachnids live if they are not found inside the house or are smaller than a Loon coin. This specimen was definitely on the larger end of that (if not bigger) but since it tolerated my flash photography it was given a second chance. I have a new lens coming for my camera that will give me much sharper shots, but hopefully you can tell these things are extremely hairy and look quite formidable. The eye reflection was pretty neat through the glass, but did not really make it through the reduction process which makes the image web friendly. By eye, I mean the reflection coming off of one or more of their eight eyes. Follow the jump to see another image of the wolf spider taken a few days later. That one has an egg sac. I figured I would go ahead and close out the Davenport Iowa bird shoot. 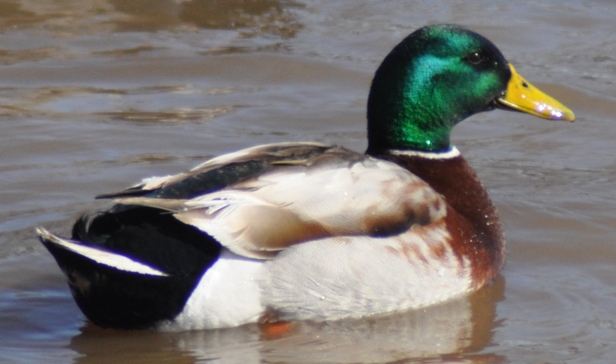 We’ve done the eagles, the gulls and now presenting..
That’s right, the Mallard Duck. This guy was enjoying the 50 degree weather in march. 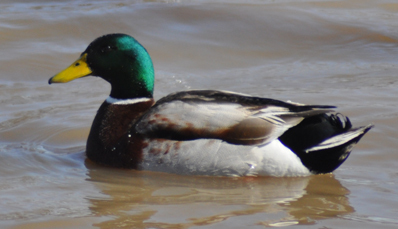 The shot turned out pretty good with the green shimmering nicely in the sun and you can even make out the water droplets on the duck’s feathers. This was pretty fitting since the Quad Cities’ minor league hockey team is actually named The Mallards. Here is another one with a different direction to the sun giving a slightly different shimmer pattern. There were actually a number of them (can’t remember the proper term for a grouping of ducks at the moment). Believe me, it was extremely tough to get them to all go in the same direction. You also have a nice mixture of the females included in this shot – clearly they were stiffed when the coloring was handed out. This post is a first for our little off-ramp on the Information Highway. Today we have, in a sense, a guest blogger. The pictures contained in this post were actually taken by my wife. As with the previous posts, these were taken up in Davenport IA. 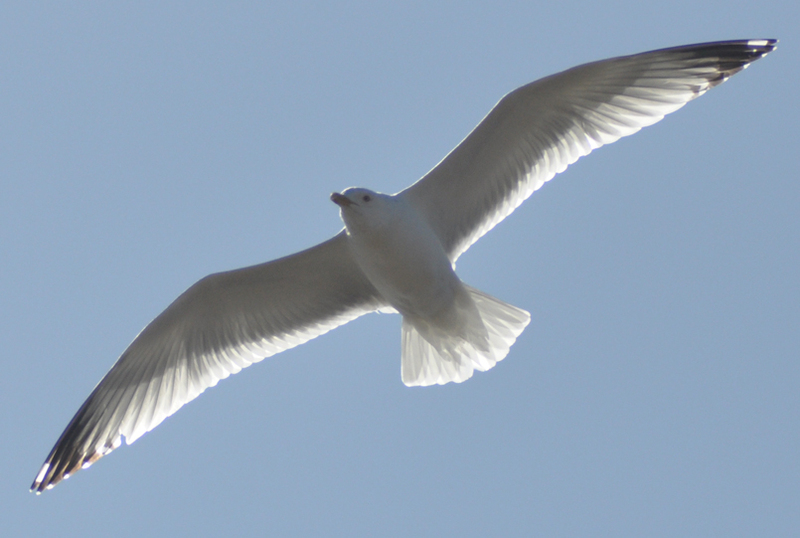 We had parked at the rollers on the Mississippi River looking for eagles and she decided to snap a few shots of a flying gull. It actually took a while to identify this particular bird. Previously, we had always referred to them as seagulls. That name was mysteriously missing from the field guides I use. After looking and relooking and re-relooking we have decided to go with a Herring Gull. The beak does not appear to have a strip (ring-billed gull) on it and the range appears to fit. 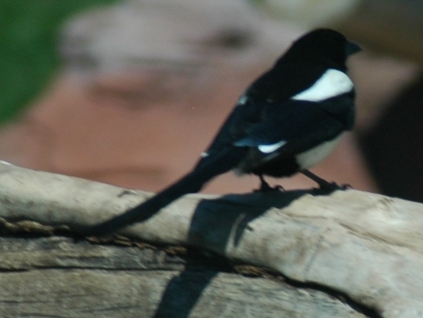 Although they are often considered the vermin of the airways, these birds do have a certain aura about them that gives the appeal of a heavenly glow. A very pure white with a touch of highlighting like a quill dipped in the inkwell. While I was trying to identify the species, it occurred to me I couldn’t see his feet (one of the gull types has yellow feet). Guessing the belly is pretty fluffy allowing him to tuck them under for greater aerodynamics – or possibly warmth. I saved the best image for last. I really like this shot and left it a little larger to hopefully show a little more detail. The sunlight radiates through the wings almost to the point of transparency. Personally, I think their quite beautiful, but then again, I do not have to live with the pain of their constant scavenging. First off, I’ve decided to go ahead and merge in my wildlife observations. I was investigating the option to have a secondary blog out there just for the wildlife stuff, but then decided I really didn’t want to manage another website. I think it still fits the overall theme of observations I see from day to day. I will tag these as Wildlife and likely a subtag with the specific category like birds, snakes (yeah, you’re getting some of those soon), frogs, bears, deer etc. So… keeping with the South Dakota trip theme, I thought I would start out with some birds we snapped while traveling out there. 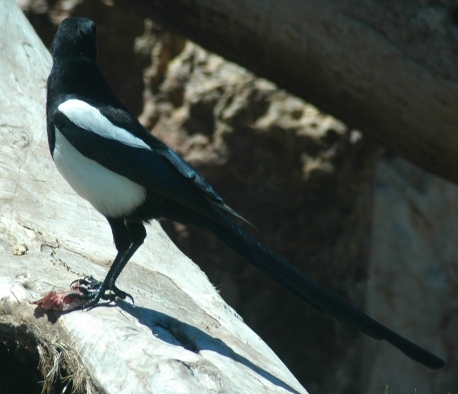 I’ll start with a flesh eating variety call the Black Billed Magpie. We were touring the Bear Country USA Drive Through Wildlife Park and I saw this fairly pretty blue and white bird on the side of the road. I actually didn’t know what it was until I returned home and found it my brand new Smithsonian Field Guide to the Birds of North America. I finally broke down and bought an updated guide, but more on that in a future post (I actually selected this book because it finally had a picture of the woodpecker I could not identify in a previous post). As we traveled a little further, I became slightly horrified by the fact that the previously considered “cute” bird was actually a flesh eating demon. I had visions of it attacking me, sticking his beak in one of my eyeballs and ripping it out of my head as it flew off into the air leaving a dangling mass of entrails oozing out of my shrieking face – hmmmm in retrospect, I might need to lay off of the late night horror movies. Based on the description in the book, it appears to simply feed off of carrion so likely little to fear here. Although, this shot looks like he is scraping an eyeball of his beak. There is another bird (Spotted Towhee) after the jump along with a blue bird I am currently unable to properly identify.